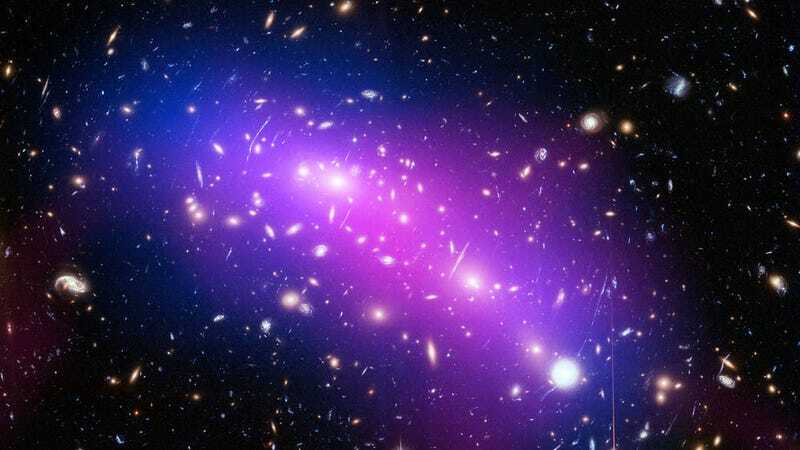 Galactic collisions are a relatively common occurrence in the universe, but every once in a while an entire cluster of galaxies will smash into another one in a massive celestial bang up. And as this new Hubble photo attests, the results can be quite dramatic. MACS J0416 looks like a single object, but it’s comprised of two separate galaxy clusters on the cusp of merging. It’s located in the constellation Eridanus some 4.3 billion light-years away, and collectively boasts a mass 420 times greater than the Milky Way galaxy. In the image, it looks like the two clusters have already collided, but the evidence suggests it hasn’t quite happened yet. For starters, traces of dark matter are still aligned with the blue-hued hot gas. If the clusters had already slammed into one another, the dark matter and the gas would have separated. Also, MACS J0416 contains a compact core of hot gas, which would also have been disrupted in the event of a collision. Interestingly, the massive weight of this object is strong enough to bend light, creating an effect known as gravitational lensing. This cosmological quirk allows astronomers to peer behind the object and catch a glimpse of galaxies that existed only hundreds of millions of years after the Big Bang.